On 13 September, the United Nations celebrated the ninth anniversary of the adoption of the UN Declaration on the Rights of Indigenous Peoples by drawing attention to the continued relevance and importance of the UN Declaration today. The day started with a press conference, where Chandra Roy-Henriksen, Chief of the Secretariat of the Permanent Forum on Indigenous Issues, in UN DESA’s Division of Social Policy and Development, Reaghan Tarbell, indigenous film maker, and Americo Mendoza-Mori, Professor and founder of Quechua language programme at the University of Pennsylvania, gave their perspectives on the UN Declaration and why it is still crucial today as a tool to ensure the rights of indigenous peoples. The press conference recalled the history of making the UN Declaration and the historical day on 13 September 2007, when it was finally adopted after 25 years of negotiation. In the UN halls, there were cheers, celebrations and relief. The efforts to draft a specific instrument dealing with indigenous peoples date back to 1982, when the Economic and Social Council established the Working Group on Indigenous Populations with the mandate to develop a set of minimum standards that would protect indigenous peoples. Even if the first draft was submitted in 1994, it took until 2007 to finalize the text. The process was delayed to handle the concerns with some of the provisions of the draft declaration, namely the right to self-determination of indigenous peoples and the control over natural resources existing on indigenous peoples’ traditional lands. The UN Declaration on the Rights of Indigenous Peoples is hence a unique document, as it embodies a global consensus on the rights of indigenous peoples and marks a new partnership between indigenous peoples and States. There have been major developments for indigenous peoples internationally since 2007, including the first World Conference on Indigenous Peoples in 2014, where States recommitted to the UN Declaration and developed concrete steps to make it more operational. This includes for example national action plans to implement the Declaration on the country level – and a system-wide action plan to ensure a coherent approach by the UN to achieve the ends of the UN Declaration. On the global level, indigenous peoples have also become more visible in major intergovernmental processes such as the 2030 Agenda, which makes several references to indigenous peoples and is based on principles of human rights, equality and sustainability, which indigenous peoples have been calling for. Yet, indigenous peoples worldwide continue to face tremendous problems in enjoying basic rights to education, health, employment, well-being – and many even lack recognition of their identities and cultures. This is why drawing constant attention to the provisions contained in the UN Declaration is essential. In the evening of 13 September 2016, the anniversary of the UN Declaration was marked with an indigenous film event about indigenous peoples and cultural survival in cities. Several hundred people had come to the United Nations to see the screening of “From Brooklyn and Back: A Mohawk Journey” by Mohawk film maker, Reaghan Tarbell” and “Bronx Llaktamanta” by Quechua film maker, Doris Loayza – two films that tell the stories of indigenous peoples, sustaining their communities, languages and identities in New York, far from their ancestral homes. While the majority of indigenous peoples still live in rural areas, more and more indigenous peoples move to cities, pushed by land dispossession, displacement and climate change on their lands and territories – and pulled by employment and education opportunities. Life in the city bring many challenges such as unemployment, limited access to social services, inadequate housing and many indigenous peoples face discrimination and racism in the city. But there are also new opportunities, such as education and employment with additional income to support communities at the origin. Contributions from indigenous peoples to the city are numerous, including their work contributions, their knowledge about sustainable living and their contributions to diverse, multicultural societies. 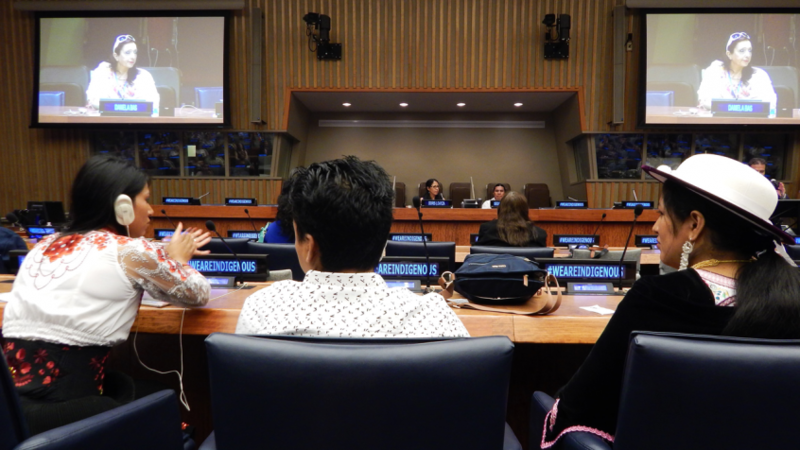 The evening was opened with remarks by the Director of UN DESA’s Division for Social Policy and Development, Ms. Daniela Bas, who emphasized the relevance of the UN Declaration on the Rights of Indigenous Peoples in implementation of the 2030 Agenda – and welcomed indigenous artists and film makers and their important role in promoting indigenous cultures. After the screening of the films, the two indigenous film makers, Reahan Tarbell and Doris Loyaza, were joined by Segundo Angagamarca who runs a Kichwa Radio Programme in New York. The three engaged in a Q&A session with the moderator, Damian Cardona Onses, Acting Chief of the Communications Campaigns Service in the United Nations Department of Public Information. The audience were curious to know more about how indigenous communities make a living in New York, the role of the women and men in transmitting indigenous knowledge, language and cultures to new generations – and how different indigenous peoples come together in solidarity. This subject of indigenous peoples in urban areas is indeed relevant in light of the 71st Session of the UN General Assembly, which started the same day. Here, world leaders will gather to discuss a range of issues including refugees and migrants. The two indigenous films shed light on these topics and how indigenous communities living far from home have contributed positively to the societies we live in.